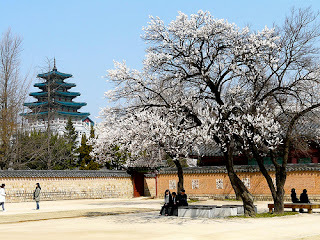 A Year With Chris Teacher in Suji, South Korea: Snow in April? Korea - I love you, but can we stop with the cold/wet weather already?!?! Normally I love snow...in Minnesota! Spring in Korea is supposed to be warm and gorgeous with little to no rain. I am patiently waiting for all of the cherry blossoms to bloom! Right now I am in the middle of correcting essays. I had my fifth grade class write about their dream jobs and I am so happy that everyone took the assignment seriously! Apparently I am teaching future archaeologists, robot scientists, MIT professors, psychologists and food scientists. What an honor! ^-^ I also had the students ask their parents about their jobs and if their parents love their jobs. One of my students wrote (paraphrased) "My dad is a police officer and my mom is a housewife. My dad loves his job and my mom says hers is so-so." Grading essays is always entertaining, it just takes a long time! C is for Chris Teacher! Uggg, now it's past midnight and I still have to prep for first grade. Prepping for kindergarten is always my favorite. Usually it is simply an excuse for me to color pictures and flashcards with my fancy new crayons. My little ones have learned letters A-G, colors, numbers, shapes and classroom objects so far. They are just like little sponges. Here in OH it is finally starting to feel like spring, though today is supposed to be 72 F with storms after sunset. It's finally getting to be normal temperatures for OH (60s-lower 50s) instead of August temperatures (80s) like it was all March. The cherry tree is pretty. We have a cherry willow tree in our yard, of course the puppy wants to eat the blossoms on the poor tree. I like all the colorful flowers and trees. So much prettier than the greenery if you ask me.